You don’t really need an excuse to stop and admire this gorgeous bridge, but there is another reason apart from the sheer beauty of it. 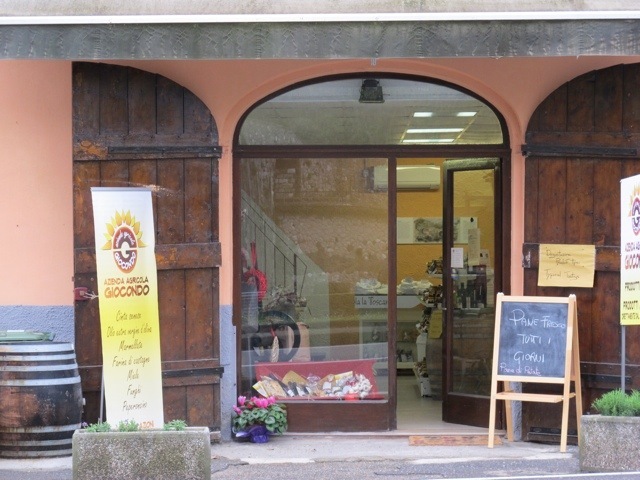 Catia from Giocondo has opened a wonderful shop where you can buy products from her agriturismo in Lugliano. It is opposite the bridge and there is parking beside the bridge. Click here to see more about Catia…she is a very busy woman. This entry was posted in Eating in Bagni di Lucca and tagged Bagni di Lucca, food, Giocondo agriturismo, Italy, local produce, photography, Ponte Maddelena, travel by Debra Kolkka. Bookmark the permalink. It looks great and I will certainly top by. I wish Catia lots of success. Catia’s products are great. I bought some of her delicious salami and her dried tomatoes. She also does fresh sausages and I will be trying this next time I call in. We drove by that bridge a few years ago, at exactly this time of year, and I recall looking at the little row of houses and shops and thinking that everything would be closed up so we didn’t stop. Now I wish we had! Next time I will. I wish she had opened in Ponte a Serraglio, but that is selfish. Italians, masters of food. I envy this kind of trips, it must be marvelous. Happy Easter. We certainly don’t go hungry here. Great place to open a business – no lack of ‘passing trade’! Lots of people stop at the bridge. She also does tastings for tour groups. 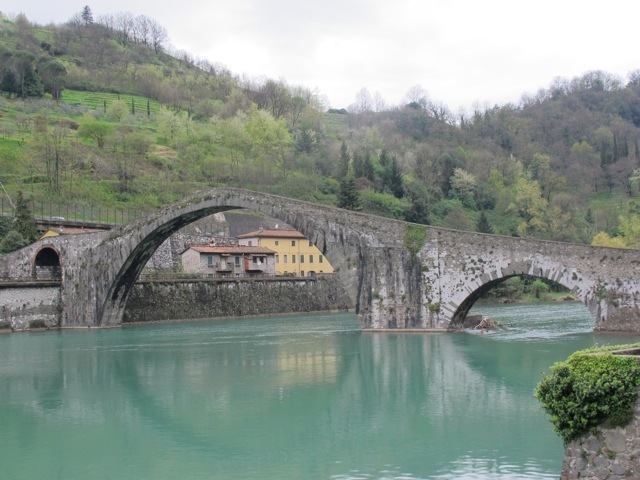 I will be in Bagni di Lucca in July and will make it a point to stop there on my way to Gombereto. It is not far away from Ponte. Catia does a great job. Looks like a great shop! I have been to that bridge twice and hope to get back there again. If I do, I’ll definitely head into the shop. It is a great addition to the bridge area. I have a little house in Verni and when we visit we have made it tradition to stop and climb the bridge… It reminds us we are nearly there and we love the traditional tale. We used to share this with our children and although they have grown it always sevens to work its magic and make us smile. We have more photos of it than I would like to admit… Early morning, evening, night time , during the rain… You name it! We will return to Verni in May for a week and will definitely stop and shop…. Thank you for your wonderful blog…. Sisto lives directly below our house in Vergemoli and I love it when he plays his music. Did you visit his house? Did you know he is 80? We were delighted the day we went to Verni and Trassilico and could hear his music. Unfortunately we didn’t get to meet him – he must be quite an eccentric character. We love the music, it really conjures up the summer for us. Unfortunately, or should I say fortunately, you are not able to drive down to it, it’s necessary to leave the car on the road and have a little hike. We have just had a pool built and will use it for the first time this summer which is going to be very exciting as we normally swim in Barga. Have you eaten at the Agroturismo in Verni – it is run by Sylvia who is, as I write about 8 months pregnant and is a most amazing cook… she has themed nights – does lots of foraging and the setting is delightful. If you haven’t already experienced it I would recommend that you add it to your to do list this summer. Lovely to eventually catch up… I have been taking notes on places to visit for a while. He is eccentric in the nicest possible way. His house is also amazing and he doesn’t seem to mind visitors. I have not been to the restaurant, but I will certainly look for it. We don’t have a pool at Casa Debbio and we won’t be putting one in, but we do have a spring which runs all year and I hope to have a place where we can sit under the water somehow…a work in progress. We have watched with interest as your house developed…. Ours was already converted ( previously a barn) … We decided to go for the swimming pool but not sure it was such a wise decision as I feel that it may end up being more work than we ever envisaged… You’ll have to come and visit if you are around in the summer… We both teach and so have a long summer break which we can spend in Verni.. I look forward to the water feature…. In progress!